WOODBURY, NJ -- For a classroom of New Jersey elementary school students looking for inspiration before a big test this week, the writing wasn't on the wall. It was on their desks. 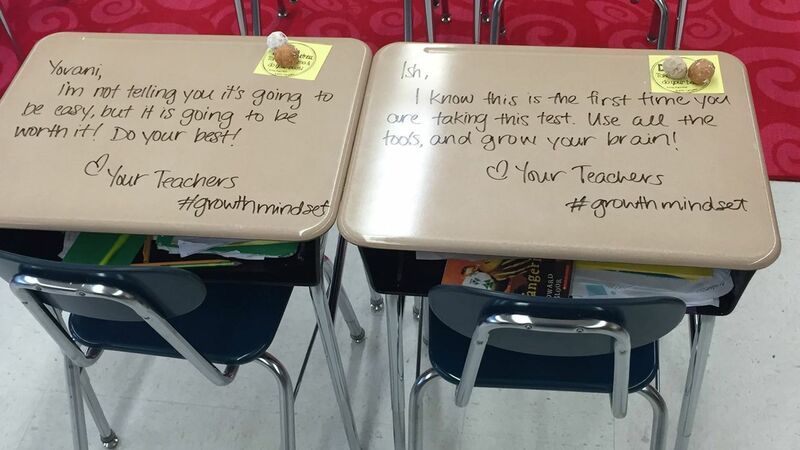 A Woodbury teacher wrote inspirational messages directly on her students' desks Monday before they started four days of high-pressure, high-stakes Common Core-aligned tests. Chandni Langford's fifth-graders walked into class Monday to find messages from her. She wrote to one student: "Learning is your superpower!" She told another: "There is no elevator to success, you must take the stairs!" Photos of the desks on the district's Facebook page have been shared more than 10,000 times and have been met with comments celebrating the teacher's attempts to encourage her students.